Mr. Sivadas Sankaran, a Singaporean philanthropist, through his Will has created a Trust to help needy Hindu children with their education. The Trust has established the Sivadas-HEB Education Fund to help disadvantaged Hindu children get a head start in life. Hindu Endowments Board, 397 Serangoon Road, S 218123. 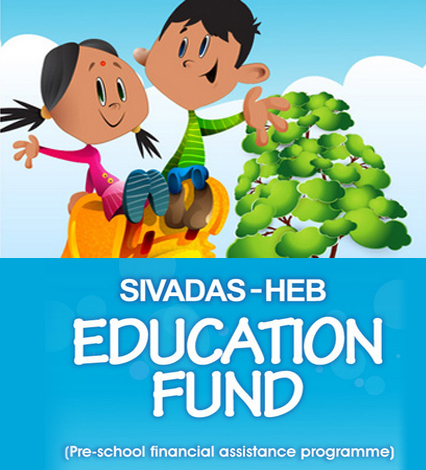 Click here to download Sivadas-HEB Preschool Bursary Application Form. All applications must be supported by the Principal of the centre in which the child is enrolled. Completed application forms must be supported by copies of relevant required documents. Sivadas-HEB Preschool Bursary, Hindu Endowments Board, 397 Serangoon Road, Singapore 218123.